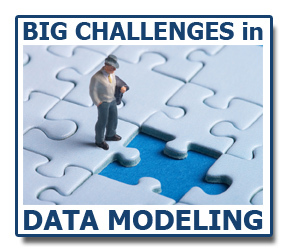 Browsing articles tagged with " Data Model Patterns"
In this month’s Big Challenges in Data Modeling #BCDModeling webinar we’ll be tackling the issue of working with models purchased or borrowed from third parties. This includes standard models, modeling patterns from books, and models inherited with software packages. Have you ever considered using pre-existing pattern models to jump start your database projects? Have you considered purchasing proprietary models? Did you know that there are hundreds of models available to you for free or for minimal cost? In this month’s Data Modeling Challenges webinar, we discusses some of the benefits and gotchas of working with acquired models – industry standard models, patterns, and other universal model concepts. · …and whatever you, attendees, want to chat about. It’s a conversation, not a presentation! My panelists will be Paul Agnew, co-author of The Data Model Resource Book, Vol 3 and David Hay, author of Data Model Patterns, and YOU, the attendees. Unlike many other webinars, you can participate in the discussion by chatting with each other, as well as asking formal questions to the panelists. While the formal part of the webinar begins at 2PM EDT, you can join early to start the chat while we go through some sound checks and pre-show rants. Also, some of us will stay on for about 15-20 minutes “off the record”. You can also ask questions on Twitter via the #BCDModeling hashtag. Registration is free, but you do have to register to get into the webinar.